I am a HUGE Disney obsessive. 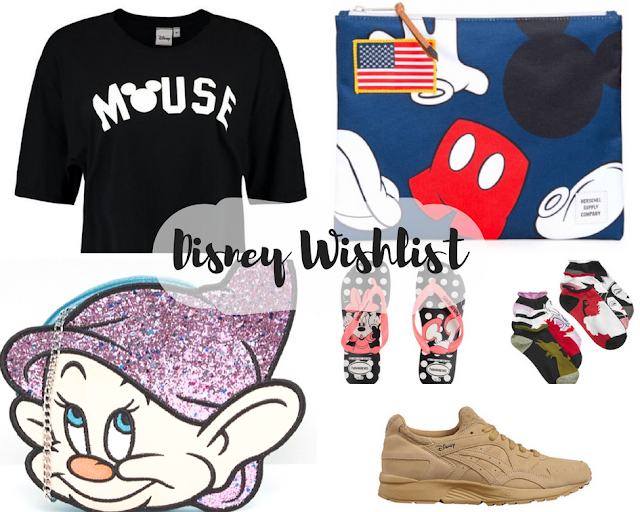 And with my holiday creeping closer and closer, I wanted to put together a bit of a dream wishlist of things that are on my radar. Most of the items are either well out of my price range, or things that would just sit on display looking pretty in my house. But with a theme of Disney, they are all things that I absolutely adore. Whilst I tend to go for products from The Disney Store for accessories or EMP for clothes, they tend to be similar style or design. I wanted to try and find things that are out of the box. Disney Villains Socks - These adorable trainer socks definitely fuel my inner villain. I am literally living for the Ursula ones and these will certainly be on the way to me come pay day! Minnie Havaianas - I've seen tonnes of Disney bloggers and vloggers with these (my lovely fellow Bournemouth blogger Brogan included!) and I love how cute and understated they are. BooHoo Mickey Tshirt - This Mickey tshirt is a great mix of subtle and statement. I love that Disney fans will immediately recognise the famous mouse, but it could also pass for a fab slogan tee. Beauty and the Beast Asics - These are a bit of an indulgence, and whilst I am normally a huge Vans fan, I've been looking for something a bit more running style. These Asics are absolutely gorgeous. I love the gold/sand colour and the subtle Disney touches on them. Disney x DN Dopey Bag - Now this is a statement bag. I'm pretty sure if I bought this, it would sit on display with my other Disney bits and bobs forever. But it's so cute and sparkly, and definitely a must have! Herschel Supply Co. Disney Pouch - I've already ordered this pouch. It's a large makeup style bag that I'm going to use in my new backpack for my personal bits and bobs. It's just a bit of a gorgeous bag. All of the items have been sourced using Lyst. Lyst is a site that I've been loving recently as someone that predominantly shops online. To be honest, I'm a bit of a lazy shopper. I tend to go for the same style, same shops and same colours and patterns. So using a site like Lyst has really helped me diversify and find more on trend styles and colours. Lyst has a collection of over 11,000 designers and shops on their site meaning you don't really have to shop anywhere else (yes ASOS is on there!). They also have amazing updates of style shoots to inspire and help you buy your next seasons key pieces. Whilst much of the site is high end, they also work with some super affordable brands too, meaning it's perfect for everyone.